Ski Sunday is back for the 2011-12 season with the team showcasing the best World Cup action. It is presented by Graham Bell and Ed Leigh and mixes classic races, features and the world's best skiers. Sonali Shah presents highlights from the inaugural Winter Youth Olympic Games in Innsbruck. Follow the fortunes of the first group of British athletes to pull on a vest in London 2012 Olympic year. Although still only in their teens, the majority have aspirations of representing their country at the Winter Olympics in Sochi, Russia, in two years' time. Sue Barker introduces highlights from Sheffield as European Figure Skating Championships draw to a close. The city's National Ice Centre has played host to some of the continent's finest over the last week in the pursuit of European individual men's, ladies, pairs and ice dance titles. Britain's Sinead Kerr and John Kerr won bronze in the ice dance competition in Bern, Switzerland, last year, shortly before retiring from international competition. Both will serve as ambassadors for the championships as British skating looks to its next generation. Graham Bell and Ed Leigh are in Austria to present coverage of the most atmospheric race on the World Cup tour: the Schladming Night Slalom - a gauntlet of fire and ice in front of fifty thousand screaming ski fans. And although Frenchman Jean-Baptiste Grange snatched victory on the Planai piste last year, the home spectators have will be demanding an Austrian win: they've taken six victories in the last eight years. Ski Sunday comes from Chamonix, the extreme winter capital of the world. Graham Bell and Ed Leigh present all the mayhem from the men's downhill, where last year Didier Cuche proved himself to be one of the best speed skiers of all time. After all the excitement Graham and Ed find some peaceful reflection with the monks of the Great St Bernard pass, and discover the legend of the St Bernard dog. With now just two years until the Winter Olympics in Sochi, Russia, Graham Bell and Ed Leigh give us a first tantalising view of the resort where the Alpine gold medals will be contested. This year it is all about victory on the World Cup circuit. The action begins with the men's downhill - how will the toughest and fastest racers in the world tackle the slopes of Krasnaya Polyana? Ed also meets the fastest man uphill, Ueli Steck, who has run up the north face of the Eiger in an incredible two hours and 47 minutes; and Graham tells the inspiring story of Pete Dunning, who was paralysed in Afghanistan and is now hoping to make Great Britain's Paralympic ski team. 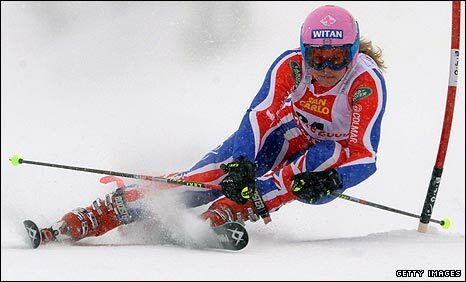 Graham Bell and Ed Leigh travel to the Russian resort of Sochi to present highlights of the Women's World Cup Downhill. Lindsey Vonn will be looking to add more points to the World Cup standings in her pursuit of a fifth Downhill title. There is also a special report on how Sochi is gearing up to host the 2014 Winter Olympics.